Depends on what kind of energetic traffic you get in your home. In my home healing studio, I smudge well before each and every client that I see. In the house itself I usually smudge once a month - more often if it feels it needs it. But I also have this mixture of blessed salt, florida water, and VanVan that I spritz around the house as I'm doing the regular cleaning (dusting, vacuuming, etc) to help keep things clear. I also burn at least one stick of high-quality incense daily while also helps keep the energy running smoothly. So depending on how often you feel it needs it, just do that. Once a week is good if you're doing nothing else on the cleansing front. Burning Sage to cleanse space? Is burning sage good for cleansing your space after any negative work? I was thinking of getting the sage bundle (http://www.herb-magic.com/sage-white-incense.html), i think it would be more convenient. It says it can be re-lit and put out and doesn't have to all be used up in one time, to put it out do i just dunk the sage in water? Yes, with bundles I normally douse them well in water, and them put them out to dry again. Also, you can grow sage in your yard easily (all varieties of sage can be used for cleansing, even though white sage is the most common used in bundles - I grow officianalis here in Canada with no up-keep whatsoever). Then harvest it and wrap it up in newspaper fastened with rubber bands. Let it dry. When you unwrap the newspaper, the sage will have dried into a convenient bundle that will stay that way when burned, and you don't have to worry about all the annoying threads that are on most sage sticks! One plant will yield PLENTY of sage for your personal use each year. I crush it out too. I use the bottom of a clay pot, the part used to catch water. I just took a paint pen and painted a few runes and sigils on it. I use it as an ash catcher as I go about the house smudging as well. You could also write a psalm or a prayer on it as well. What a cool idea-- I would never have thought o decorating like that nor using it as an ash catcher! I bought sage incense sticks because I'm so paranoid that the bundle will some how ignite again. I have a bundle, but it's at least 2 years old. Should I throw it out? Even if you don't burn it, it's still a bundle of sage. You should be able to tell if it has lost its effectiveness, and if it hasn't, it is still usable for other methods. I place my sage bush in a bowl of sand to stop it from burning, works well. I like the idea of growing my own Devi. Thanks for the info. I regularly burn sage - once a week, both inside and out in the protected area of the house so I have never had the sage get old. You can tell by the smell when it is burning how strong it is. If it is old, I would still burn it to dispose of it - just maybe do your property lines and outside as well. I even smudge the crawl spaces and attic space when I do my saging. A lot of people forget to cleanse the attics, closets, etc. The basement is a great place for negative energies to drop to, so don't forget this space either. I have aa quick question regarding growing your own sage. Do you need to harvest it before it goes to seed? Also to you harvest and rip out the whole plant? Or just harvest its branches to make your bundles? And if you harvest just the branches, do you replace the plant every 3yrs when it starts to get woody? You do NOT rip out the plant, you harvest leaves from the branches, or cut portions of the branches. I wait to harvest until after the blooms have all withered away near fall. I use common garden sage and have not found that the plant has gotten overly woody. I also would not "replace" the plant just because I didn't have much use for it anymore - you grow close to the spirit of a plant over time, and killing it is a harsh thing. If you don't trim away more than 1/3 of a branch, then it will usually sprout several other branches from that spot. My plant is VERY thick now from the yearly harvest. I usually trim a branch, and then take the leaves off for drying. If you get very in tune with the plant, it will let you know where it would like for you to harvest from! Smudging while work is in progress?????? Maybe someone can advise on this subject. 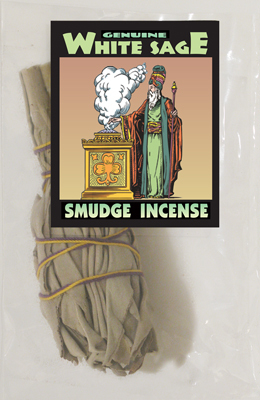 Is it okay to smudge your home with the sage products/smoke while you have spellwork currently in progress? I do not want to mess anything up. I have a doll that I am working on, which the target has not responded yet, and a honey jar that I burn candles on 3 times per week. I have had a reading already, and I was given other instructions to follow as well, but I was just wondering if maybe it is time to cleanse my home, for I have not done it in the past two years, and even when I thought I was doing it, it was probably incorrect. And over that time, I have also experienced some of the hag riding that was talked about in some of the threads that I have been reading here on LM. I hope I started this in the right place. Any suggestions? Re: Smudging while work is in progress?????? You can cleanse your home while work is ongoing. To us (Native American) sage is one of the most sacred plants for both protection and medicine. We are taught when you harvest the plant you should first thank it for the protection it will give you and ask for it's blessings in your work. If you have any you do not wish to burn for what ever reason return it to the earth--bury it but do not throw it out. I smoke off my house every day. This is because I have a lot of people that come by and each person that comes in carries things with them. In this way I keep my house clear of negative influences. I always use my sage bundle to cleanse myself, my space and house. I am growing it in my back yard though for some reason it is not growing as well as my other plants like say Rue or Rosemary. But fall is starting to I will have to take a bit of it and dry it to make a bundle or plant some in a pot because once snow hits here forget it! I have a sage I bought six months ago, and have been wanting to burn it. [*] Do I start from my attic down to my door (I have a two story home) ? [*] Do I open the windows and door? [*]Should it be just me in the house? [*]What else should I know before conducting this? You start from the back of the house to the front and I personally do open the windows...It doesn't matter if others are in the house...there's nothing else to know before conducting it...you're not performing an exorcism you're just cleansing your space of possible negative energy. Thanks for responding to my questions. What prayer or what should I say when smudging sage? You can just pray as you work, calling for your house to be cleansed, or, if you are comfortable in the tradition, you can pray Psalm 37. I've been having to take care of a family estate and it's been one headache after another. Since it's a fair distance from my own home, I tend to stay at the property when I'm trying to work on cleaning it out. Growing up it was always a happy, comforting place, but after my parents died it just seemed to have a very chaotic, heavy feel to it. I assume that it was from illness, different family members in and out during that time (some with less than good intentions), and family turmoil during the estate process. It got so bad that I personally started having all sorts of bad things happen, some quite financially devastating and not so normal. When the heater went on the blink again in one part of the house (part of the 1st floor) during a 15 degree day I just threw my hands up in the air and had enough. I had NO money left to pay for a technician to come out. A knowledgeable friend tried to work on it without success for hours, so I had scheduled a callback for this morning (Monday) to find out the cost of a service call. I broke out my white sage on Sunday afternoon that had been in a drawer here for a while. I'm not sure if this house had ever been smudged (my Mom had mentioned it many years ago) and it's >100 yrs old. Anyway, I'm not sure that I had even done it correctly, but I tried my best. I also had a small bottle of holy water that I kept with me as I went around the house because things "felt uncomfortable" as I started to smudge. I smudged the house, me, the cats, computers, and lastly, my wallet asking for money to come into my wallet and stay there! While I was in the basement I focused on the heater and as I spoke my intention I also asked my guardian angels and any family members in the white light to please make the problem easy to find, then I splashed some holy water on it. Anyway, after I was done with the entire house I felt REALLY uneasy and agitated for about 2 hours and thought that maybe I shouldn't have done it. I honestly felt like I made something very mad. At that point the kitchen was SO cold it was 38 degrees - still no heat. I fell asleep for a little while until the cats kept bugging me for food. I went downstairs to get them fed and as I walked down the stairs it felt very warm, almost toasty - QUITE unusual! Please understand that even when the heat is working properly in the house, it's NEVER warm in the house because it's a VERY old house and has MANY drafts. I realized that not only was the heat working, but the house no longer had the normal chill in it!!!!!! I could hardly believe it! In a million years I never expected the heater would work......and work WELL! The wierd thing was that I just CANNOT get over the temperature change in the house. I AM DEFINITELY NOT imagining it. Even before the heater problem, the house was always chilly and you could physically feel the cold coming in through the old windows if you were near them. Not only do I feel warmer, but if you go near any of the windows, they DO NOT feel cold AND IT'S BELOW FREEZING OUT! As the heater company called me at 7:30 thing morning, I just smiled and told them I didn't need them.... One other good thing happened today related to $$, I had to return a gift that was 12 days past the store's STRICT return cutoff, not only did they take it back and return my money, but she didn't even give me a hard time about it and that's not usually how they work there. It's funny, today the house has a noticable calm about it.....the cats are even getting along and resting quietly (they're usually on edge all the time & easily startled). One last thing that's sort of wierd is that the small room where I have my computers and a TV, etc. usually sounds VERY loud when everything's running, but oddly enough even that room seems very "quiet". Anyway, sorry for the length of post, but I thought this might be of interest to others. BTW, I smudged myself before AND after because I felt SO negative and didn't want it to interfere with my focus. Hi, I just used white sage yesterday to smudge the entire house. Although I had used it before to purify a small space I had never used it for a whole house cleansing and was quite pleased with the outcome. My testimonial is immediately above. 1.) Are there instructions on LM's site as to the proper technique? I smudged a multi level home and I wasn't sure what floor to start on and what direction to go in on each of the floors (clockwise, counterclockwise, etc). 2.) Should you open a window as you're smudging? If so just one in the whole house or each room? 3.) Can you smudge a situation or a person that is not present (I know that sounds dumb). For example, if someone keeps bringing dark, chaotic energy around (via phone, email, etc.) could you smudge a picture of them instead of the actual person (because they would have NO part of it or are not local). 4.) Is "liquid sage" an equal substitute for the dried sage in situations where you really can't use the smoke from a lite sage product? Does LM sell a sage spray? 1.) In hoodoo we clean (whether by mopping, censing, or sprizting, from top to bottom and back to front. That is, start at the ceiling of the farthest back topmost room of the house. The idea is to end at the front door. If you and everyone who visits sues a side door to enter the house -- then you enbd at that door, which is the de facto "front" even if it is on the side. I was never given any instructions in hoodoo by my elders to move clockwise or counterclockwise. A lot of flks in WIcca have ideas about that -- and i WAS given such instructions with respect to other oodoo spells (such as dusting candles or doing road opening spells), but in cleansing, i was always told, "back to front and top to bottom" or "top to bottom and back to front." 2.) That is up to you. The old techniques -- which included sulphur suffumigation (toxic!) involve lighting the incense and shutting all doors and windows, then returning. 4.) "Liquid Sage" is -- one would hope -- essential oil of Sage. We sell that, and we also recommend that people with smoke sensitivities use essential and fragrance oils on various ways, such as dripping into boiling water to diffuse as scented steam, placing on a light bulb to diffuse, and so forth. These techniques are old enough to be considered standard by now, The water method is ancient, and even the light bulb method dates back in printed books to the 1910s, about 100 years ago, as electric lights came into use throughout most of the USA. You will find information on our essential oils elsewhere on the Forum and in our online catalogue. Hi Cat! Thanks for the quick replies, they're appreciated. I have a question about reply #1: If there's a basement in the house, but no door that anyone would use down there how would I fit that into the top down order ending at the front door? Is it okay to start there first, then go to the uppermost level and work your way down to the front door? That's how I did it yesterday. Regarding #4, yes, it would be a liquid with essential oil of sage. I just remember my Grandmother keeping some in a spray bottle for use, but I think it may have been diluted a bit with either water or alcohol. I have wanted to try the reed dispersion technique with Sage Oil. It would be great to have that scent in the house on a regular basis, without all of the heavy smoke. if the basenment is reached only by an outside door (like a storm cellar), then it is a separate rea with its own door. If the basement is reached via steps inside the home, then i would work "top-to-bottom and front to back" but when i got to those steps, i would go down and do the basement, then come back up and continue toward the front door. I recently got a bundle of sage to smudge/cleanse our old farm house but just wanted to know if anyone can answer for me why the bundle of sage wouldn't stay lit and would go out even when I tried blowing it to get the sage smoking.???? It made smudging very hard as I had to keep relighting it. cancermum, there are a couple of reasons that this could be happening. One very simple answer is that the bundle is so tightly wound that you can't get a good burn. You might consider breaking the bundle apart to allow more air flow. Many people will also break off some sage into a cauldron or shell to burn more like incense. I would try that first and see if you get better results! I've always relied on my intuition for knowing when to Smudge with White Sage. Since I'm often working with my crystals or creating crystal grids, I Sage regularly because I'm doing energy work and I don't want to bring anything I've collected outside into this space. But if you aren't doing energy work regularly I still recommend regular meditation either in a group or on your own to keep your vibration high and your intuition flowing. This helps keep a connection with your higher self and lowers the influence of your ego. That being said you could Sage once a week when not doing regular energy work like using Oracle cards, working with your crystals, or any type of divination. The longest I would go is a month and that's pushing it. Welcome to the Lucky Mojo Forum, Maurice. I find it interesting to see how Sage is used in various paths and traditions. In hoodoo -- which is what this forum centers on -- Sage was adapted and adopted from its popularity in Native American usage, and it has to a certain extent displaced the indigenous use of Pine Needles and Pine Resin as a space-clearing and ghost-purging incense among descendents of the Cherokees who contributed their knowledge to African American culture. Not too many folks here do energy work, so it is always nice to hear from another aspect of the magical world. I prefer sage for clearing outside and sweet grass or cedar for inside. Maybe it's just me but I noticed that the few times I burned sage prior to or in conjunction with casting a spell that it seemed to make the spell stronger. I know sage is mostly used for ridding negative energy and promoting purity but it seems that it also raises the spiritual energy during a spell, I guess due in part to the purification. Again, I don't burn sage all the time while casting spells but during those few times I did I could definitely tell the difference. Has anyone else ever had this experience? I'm sorry but we don't do polls or similar type of questions on the forum. It's wonderful that you get this type of result from burning sage along with a spell. Sometimes, ridding your space of negative energy has the added benefit of removing any obstacles that energy might have placed on your subsequent spell, so you are reaping the rewards. I'm glad you have shared this experience with our forum members, so thank you for that. I wish you continued good luck with your spells!